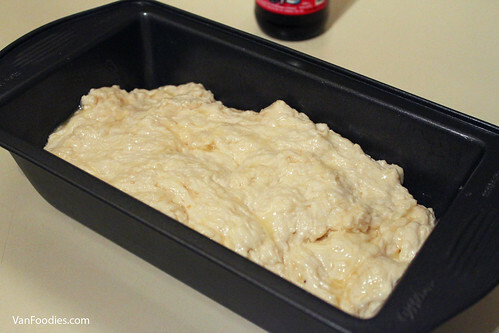 One day as I scrolled through my Facebook feed, I came across this tried and true Beer Batter Bread recipe on Epicurious. Mr. always bugs me about not baking enough, and that he misses my occasional baking (when are you going to bake me another pie?!). And since Mr. likes freshly baked bread, I decided to give it a try. The recipe is very simple and doesn’t require yeast or proofing. It just needs a bottle of beer. But it doesn’t specify what kind. Perhaps back then, one would assume it’s asking for a bottle of domestics, like Bud, Coors or even Molson. Fast-forward to 2016 and we have so many craft beer options now! And thanks to Bryan, we have become a bit of a beer snob, so the lightest beer I could pull out from our stash was the Parallel 49 Jerkface 9000 North West Wheat Ale. Wheat ale for a bread recipe? Why not! 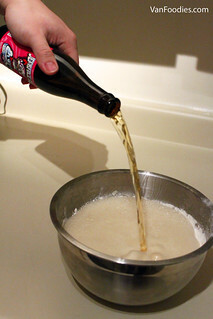 And with a heavy heart, I poured a bottle of the Jerkface 9000 into the bread batter. The colour of the batter remained quite pale, and in the oven it went (after drizzling the melted butter).